Spooktacluar DIY Halloween Costume Ideas you’re going to love! Are you looking for some easy and cute DIY Halloween Costume ideas for kids? We are a slow out of the gate this year and have just started discussing with the kids what they want to dress up like for Halloween this year. So, we were doing some searching online to help us come up with some ideas. 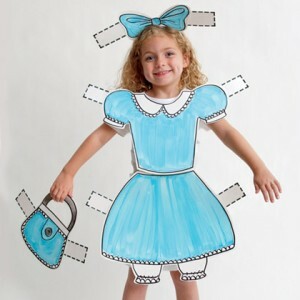 In the process we found several absolutely adorable DIY Halloween Costume ideas. So of course, I rounded 10 of them all up in one easy to find place. What is it about little kids and Star Wars? 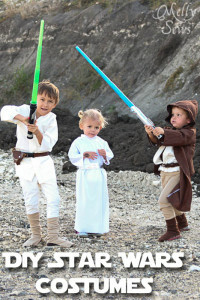 Ok, I may have a bit more push in this department too but seriously, can you imagine if my littlest one dressed up as an Ewok and the older two dressed up as Luke and Leia? Cuteness overload!! 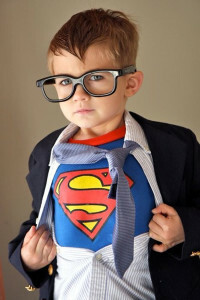 I nearly passed out when I saw this Superman/Clark Kent costume on Geek Tyrant–cuteness overload! And talk about easy–there’s not even a tutorial for this one because none is needed! All you have to do is purchase a Superman t-shirt and pair it with clothes that your little guy probably already has! Both my oldest and my youngest daughters want to dress up as the Little Mermaid this Halloween. 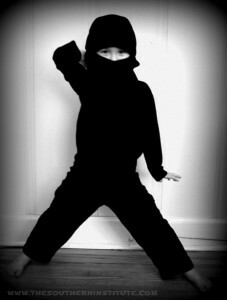 Granted, the oldest has turned her into a Punk but this costume is perfect for my younger daughter. 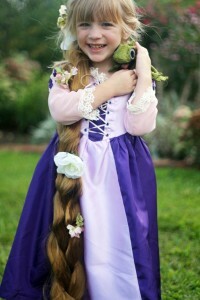 This Rapunzel costume is one of my favourites! I love the cute little Pascal sitting on her shoulder. This one would be a lot of fun if you are looking for something a little different then your mainstream ideas. Plus it has a ton of character! This is the perfect base for any lego costume! What is your favourite DIY Halloween Costume Ideas for kids that you have seen? Want to pin it to save these awesome ideas for later? See what else I have pinned on Pinterest. I like the simplicity of the Superman costume. I like using things already on hand for costumes. 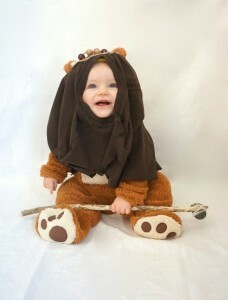 However, those Star Wars costumes are totally awesome! These are fun ideas. I like that they are cheap and easy too! Love all the ideas! I always bought my son costumes, but always wondered about working on making one and having fun with it! Thank you for sharing it! I just announced my Halloween contest winners today for dog lovers and our favorites are always the creative homemade ones. You have fun ideas here. These are all fantastic ideas, but I find the ET is especially cute! I love it! These are so great! I am in love with all of them. The Clark Kent breaking into Superman is both unique and easy to do. My favorite, though, is the paper doll. I have never seen that before and it is adorbs! I love the Lego one! And I’ve never seen the ET one, that’s very clever. And the bike, nice no complaining walking hurts my feet lol. The E.T. is one of my favourites! A little harder for trick-or-treating but it’s too dang adorable! 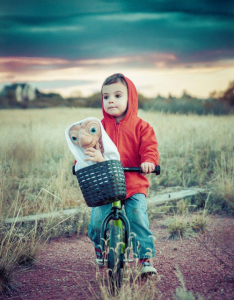 I love that ET costume. Not an easy one to trick or treat in, but who cares. It’s so darn cute. Those are adorable! 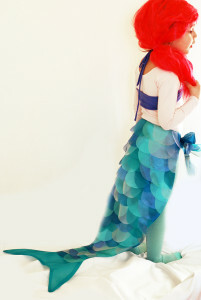 DIY costumes are so much more interesting than store-bought ones! Oh these are so cute! That lumberjack has one manly beard! I am loving all of these ideas! My favorite has to be the ET! How adorable! We do not celebrate halloween but these are such adorable ideas. I like that they are not scary and look so easy to make! These are all such cute Halloween costumes! My favorite is the paper doll. That is so creative. These are AWESOME! I still love E.T. And the Clark Kent one is SO cute. My son is going as Superman but I think he’d be the cutest Clark Kent too. Okay I admit it I am loving the ET costume. That was my childhood right there and the Star Wars. Those are all great. That Lego guy one is hysterical – I love it. These are amazing! We were going to do a Little Red Riding Hood theme and I was considering doing the lumberjack with beard for my baby but my daugher changed her mind. It would have been a cute though! 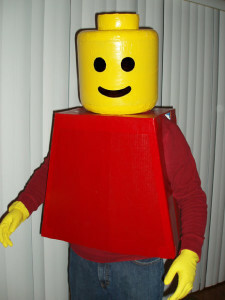 The LEGO man costume is pretty awesome too. My nephews would get a kick out of it! My favorite is the ET! I still don’t have a costume for my oldest! 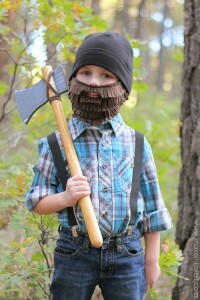 Oh man, that little lumberjack!! 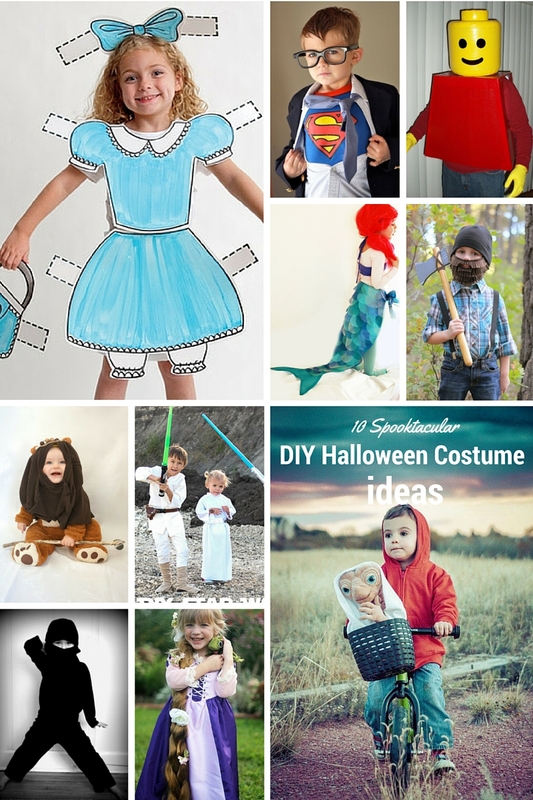 You’ve got a lot of cute and original costume ideas here! We are having a no spend Halloween over here, so I’m really excited about all these great ideas! My daughter loves the paper doll! Thanks! These are great costume ideas. We did the Clark Kent idea a few years ago. It was one of my favorite costumes!